Trainer Bob Baffert rubs the head of American Pharoah outside the stakes barn on Sunday, a day after he won the Preakness Stakes and set up a shot at the Triple Crown. Dortmund won't be around for this one, but a familiar cast of 3-year-olds are lining up as potential spoilers when American Pharoah attempts to win the Belmont Stakes and give thoroughbred racing its first Triple Crown winner in 37 years. Dortmund is the Kentucky Derby and Preakness winner's stablemate. Both are trained by Bob Baffert. Dortmund, third in the Derby, was given a strong chance to turn the tables in the Preakness — and upend his own trainer's Triple try. He finished fourth, though, and was headed home to California for a break. American Pharoah is Belmont-bound after splashing his way to a seven-length victory in the Preakness on Saturday. He's heading to Churchill Downs on Monday, then off to Belmont Park in New York on June 3 — three days before the 1 1/2-mile Belmont. "I understand," Baffert said. 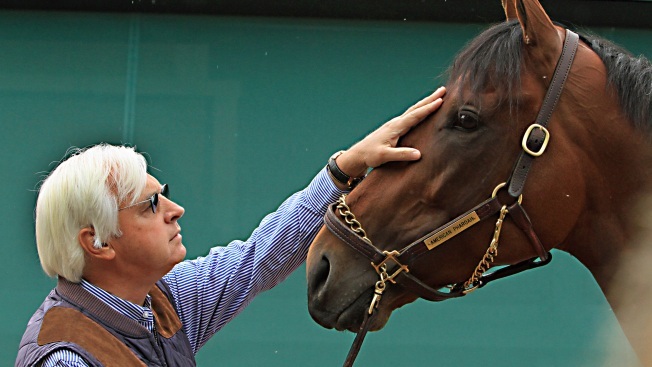 "It just shows the respect they have for American Pharoah. It's something you can't control. You have to earn it, just like he earned it in the weather yesterday. I've seen a lot of great horses leave here and (lose) in the Belmont — Smarty Jones, Big Brown, Real Quiet, Silver Charm, Funny Cide. I'll Have Another (in 2012). You just don't know." One of Pletcher's probables, the Florida Derby winner may have had the toughest trip of any Derby horse. He was bumped at the break, and started an unaccustomed last in the 18-horse field. He was again shuffled back on the far turn, but found room near the rail under Javier Castellano and finished strong for sixth place. A two-time Belmont winner (Rags to Riches, 2007; Palace Malice, 2013), Pletcher likely relishes the chance to play spoiler, especially on his home track. Held out of the Preakness, the son of 2005 Preakness and Belmont winner Afleet Alex worked 4 furlongs in 49.03 at Belmont on Saturday. "With the downpour and everything (at the Preakness), I was happy we were safely at home and got a good work into him," Pletcher said. Not the most dynamic note listed on his Derby chart, but the gray colt still finished fourth despite several issues, including being taken five wide around the far turn under jockey Joel Rosario. Trained by New York-based Kiaran McLaughlin, the Wood Memorial winner has been a project, but his best racing may be ahead of him. He skipped the Preakness and should be fresh for the Belmont. When he's good — Wood Memorial — he's really good. When he's not — fourth in the Fountain of Youth — he's really not. His latest workout was Friday at Belmont, 4 furlongs in 47.64 seconds — the fastest of 31 at the distance. 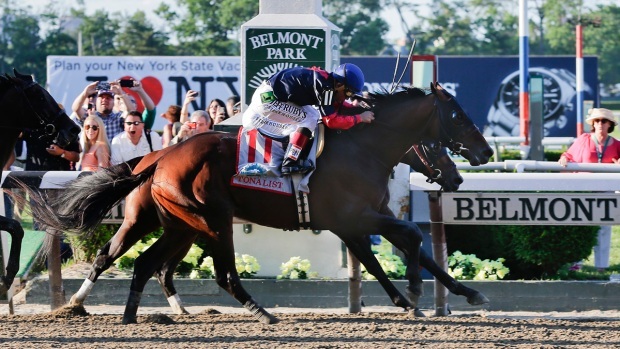 How Much Do You Know About the Triple Crown? Tenth in the Derby as the third betting choice at 7-1, Carpe Diem simply faded in the final quarter-mile and was 11 lengths behind American Pharoah. He's probably a much better horse than that, and Pletcher wisely kept him out of the Preakness. A son of Giant's Causeway, the colt comes into the Belmont with four wins in six lifetime starts, including the Tampa Bay Derby and Blue Grass Stakes. Not a bad resume. Never count out Nick Zito. The Hall of Fame trainer hasn't had too many top horses the past few years, but he's spoiled a Triple or two. In 2004, it was his 36-1 long shot Birdstone who ran down Smarty Jones in the final 70 yards of the Belmont, and in 2008 it was his 38-1 shot Da' Tara who won after Big Brown was pulled up around the far turn. However, Frammento barely made it into the Derby field, finished 11th and would come into the Belmont with only a maiden win in eight lifetime starts. He will be a long shot for sure, but that's when a Zito-trained horse becomes a threat.